Ajith Kumarasiri is a musician, songwriter, and composer living in Sri Lanka, a country ravaged by civil war that is currently functioning under a state of political corruption, religious intolerance, and social disorder. Filmmaker Callum Macrae's "No Fire Zone" reveals that this 26-year-long war resulted in some of the worst atrocities of war crimes and crimes against humanity of recent time. A proclaimed secularist, Ajith conveys the need for people of different ethnicities and religions to co-exist in peace and love. He’s worked for the Centre for Religion and Society and for Peace and Reconciliation with the Centre for Peacebuilding and Reconciliation and Fict. Ajith lived through his war-torn country when Tamils were victims of mass killings of Black July in 1983 and youths were arrested and killed during the attempted Janatha Vimukthi Peramuna (JVP) rebellion against the state. He was deeply affected, losing many Tamil and Sinhala friends. He responded, not as a fighter but as an artist, using his music to combat the injustices and destruction in his country. 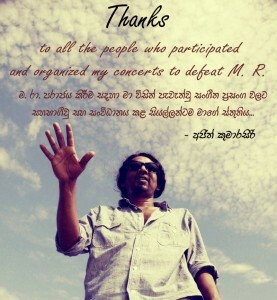 While many artists and musicians conformed to state mandates that supported government propaganda, Ajith remained independent in his voice, traveling with his guitar and singing for freedom and human rights. 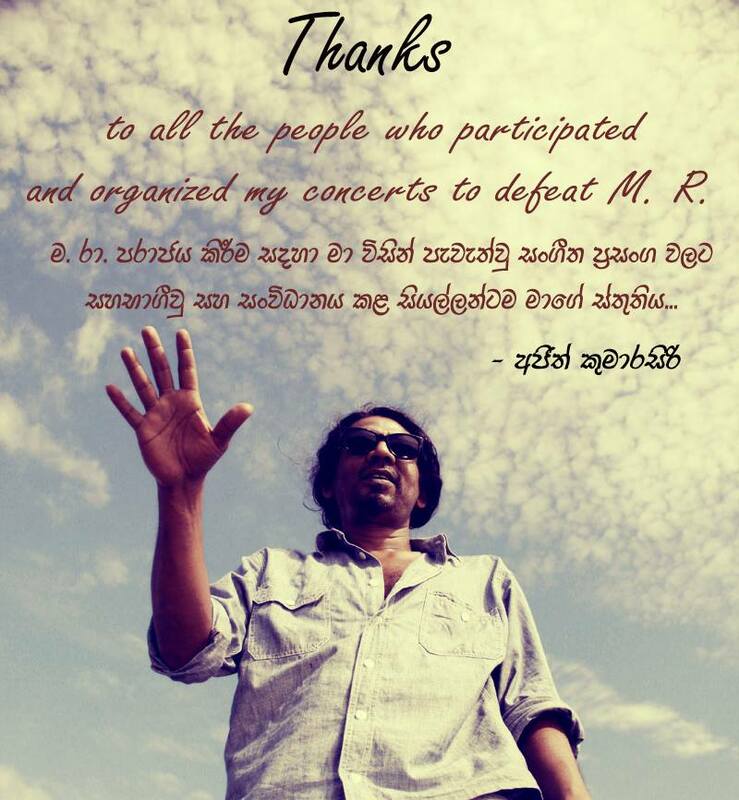 He was an early activist, singing John Lennon’s “Give Peace a Chance” in Sinhalese, Tamil, and English. His music brought hope to those who were terrorized and isolated where shelling occurred daily. For Ajith, art is not a passion. It’s a mission. He is a mirror of his culture and time. He thinks of music as part of the subject of noise. His music is an arrangement of harmony and the interruption of discord—representational of life. Embracing all people, his music does not adhere to one style. He is not fixed, nor is his art. He enjoys fusion of music forms and various instruments, he plays solo and in bands. He values the accessibility of the box guitar, references “Romeo and Juliet’s” thumb-biting allegory to explain how he interacts with Sri Lankan authority, is influenced by Ludwig von Beethoven’s symphonic scores, and inspired by the raw texture of John Cage, incorporating tools such as a cement mixer into his music. While Sri Lanka is no longer fighting a civil war, the island is unsettled because of the state’s unwillingness to heal its human rights offenses and alleged wartime atrocities, as well as control Buddhist extremists. As reported in the Sri Lanka Brief on January 2, 2015, for the last 10 years Sri Lanka the Rajapaksha regime has ruled Sri Lanka as an authoritarian state. Opposition to the ruling party is strong. 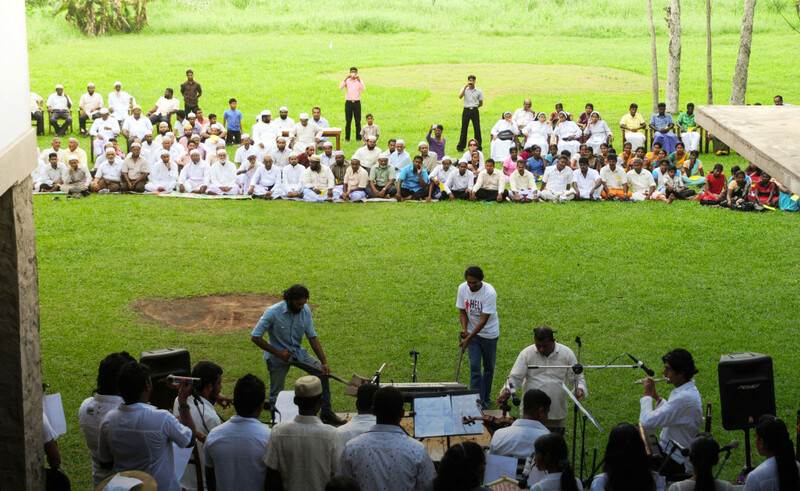 On December 29, 2014, while campaigning in support of presidential candidate Maithripala Sirisena at Kumbukgate in Kurunegala, the artistes' collective "Aluth Parapura" was attacked by political thugs. 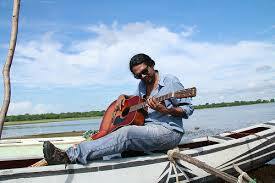 ActressSamanalee Fonseka and singer Indrachapa Liyanage were injured. On January 3, 2015, Ajith scheduled three shows at Kumbukgate. He was determined to perform there, despite the risk. A day later on January 5th, Ajith sent a message that his concert was stopped by the police and he expects on election day, the military will be more involved threatening the election process. The election on January 8th resulted in an unprecedented high turnout with little violence and disruption. The Rajapaksha regime was defeated by Maithripala Sirisena, ending a decade authoritarian rule. The Catholic Herald recently published a column explaining that since 2014 there has been an increase in Buddhist aggression against Sri Lankan minorities. The Bodu Bala Sena "Buddhist Power Force," or BBS, founded in 2012, says its efforts are to protect its Buddhist identity. While the BBS explains it wants to remain distant from all violence, violent rioting follows BBS rallies. Such extremism is dangerous to Muslims in Sri Lanka and nearby Burma who are viewed by the Buddhist extremists as threats wishing to destroy their culture. In August 2014, a Sinhala newspaper headline read "Shoot NGO traitors and throw them to foxes to eat." Ajith’s song “Hey Geneva” promotes the idea that Sri Lankans do not kill any more while being cynical of the corruption of the public sector. The people want their peaceful island returned to them. When we asked Ajith what he thinks about the Jewish Kulturbund artists, he said that when the artists were forced out of German culture, their response was to organize so they could continue to perform, maintain their identity, and survive. He thinks today artists need to organize around the world as the Kulturbund did in Germany.